Earlier today, I gave a speech about populism and capitalism at the Free Market Road Show in Thessaloniki, Greece. But I’m not writing about my speech (read this and this if you want to get an idea of what I said about American policy under Trump). Instead, I want to share some remarkable data from a presentation by Ewa Balcerowicz of Poland’s Center for Social and Economic Research. She talked about “The Post Socialist Transition in Poland in a Comparative Perspective” and showed that Poland and Spain has similar living standards after World War II. But over the next 40 years, thanks to the brutal communist system imposed by the Soviet Union, Poland fell far behind. But look what has happened over the past 25 years. Per-capita GDP has skyrocketed in Poland and the gap between the two nations has dramatically narrowed. 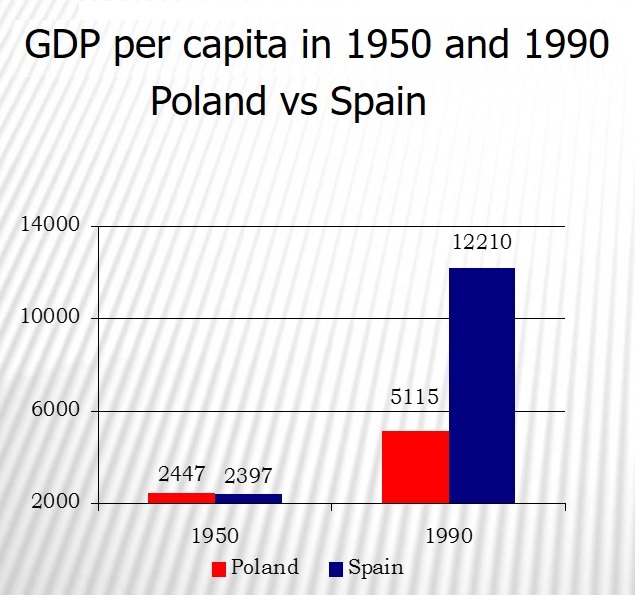 So why is Poland now rising relative to Spain? For the simple reason that public policy has moved in the right direction. 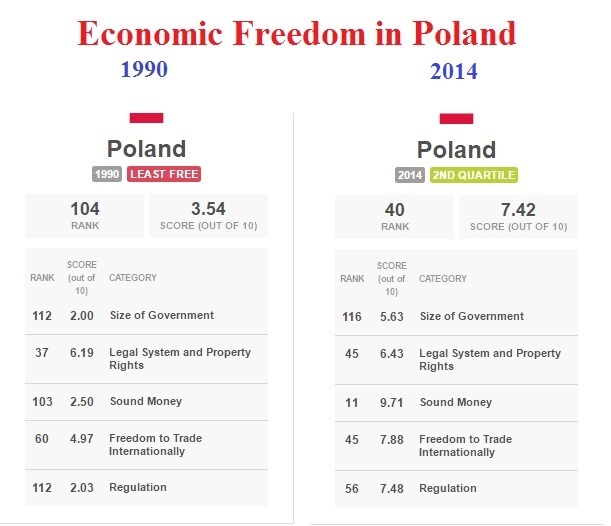 Here’s the data from Economic Freedom of the World, comparing Poland’s score in 1990 and today. Poland has jumped from 3.54 to 7.42, and the nation has jumped from a dismal ranking of #104 to a respectable ranking of #40. Which means that we shouldn’t be surprised if per-capita GDP in Poland soon jumps about Spanish levels. Just as Poland has out-paced Ukraine because it has better policy. Here are additional examples showing the long-run benefits of pro-market policy. And here’s a must-watch video on the relationship between good policy and better economics performance. All of which helps to explain why I’m so disappointed in both Bush and Obama. Their statist policies have caused a drop in America’s score and relative ranking. I very rarely feel sorry for statists. After all, these are the people who think that their feelings of envy and inadequacy justify bigger and more coercive government. And I get especially irked when I think about how their authoritarian policies will hurt the most vulnerable in society. But I nonetheless feel sorry for statists when I see them fumble, stumble, duck, and weave when asked why global evidence contradicts them. In other words, it’s almost painful to watch when they are asked why nations with varying degrees of statist policy – such as Venezuela, France, the United States (under Obama), Argentina, and Greece – suffer from economic stagnation and decline. And it’s equally uncomfortable to watch them struggle and squirm when they’re asked to explain why jurisdictions with more pro-market policies – such as Bermuda, Estonia, Switzerland, the United States (under Reagan), Chile, and Singapore – tend to enjoy growth and rising living standards. However, I can’t help adding to their discomfort. Let’s look at more evidence. Here’s some of what Richard Rahn wrote for the Washington Times about Hong Kong’s economic miracle. Hong Kong is about as close to the ideal free-market capitalist model that you can find on the planet — which came about largely by accident. …The British basically left Hong Kong to fend for itself… here was no foreign aid and no welfare state — but there was a competent government that kept the peace, ran an honest court system with the rule of law, provided some basic infrastructure, and little more. Also, Hong Kong had economic freedom — for the last several decades, Hong Kong has been ranked as the freest economy in the world (according to Economic Freedom of the World Index). Economic freedom allowed the people to create an endless number of productive enterprises, and because they had free trade, they could import necessary goods and services to fuel these enterprises. …average real income has gained parity with the United States, and it will probably be double that of France in a couple of years. By the way, if you don’t believe the last sentence in that excerpt, check out this remarkable chart. But the big takeaway is that free markets and small government have made the people of Hong Kong very rich. Gee, it’s almost as if there’s a recipe to follow if you want prosperity. Let’s look at another example. Writing for the Wall Street Journal, former Senator Phil Gramm and Michael Solon compare economic policy and outcomes in Ukraine and Poland. 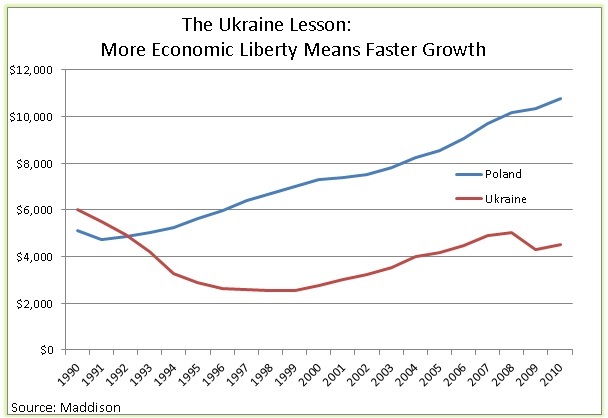 They explain that statist policies in Ukraine have stymied growth in a nation that otherwise could be very prosperous. There is no better modern example of the power of an economic triumph than the experience of Ukraine and Poland in the post-Cold War era. …Ukraine has largely squandered its economic potential with pervasive corruption, statist cronyism and government control. …The per capita income of Ukraine, in U.S. dollar equivalence, has grown to only $3,900 in 2013 from a base of $1,570 in 1990. …Ukraine should be a wealthy country. It has world-class agricultural land, it is rich in hydrocarbons and mineral resources, and it possesses a well-educated labor force. Yet Ukraine remains poor, because while successful Central European nations have replaced their central-planning institutions with market-based reforms, Ukraine has never been able to break the crippling chains of collectivism. Poland was in the same position as Ukraine after the collapse of the Soviet empire, but it followed better policy and is now several times richer. By employing free-market principles and unleashing the genius of its people, Poland has triggered an economic triumph as per capita GDP, in U.S. dollar equivalence, soared to more than $13,432 by 2013 from $1,683 in 1990. Today Poland is the fastest-growing economy in Europe. …The man largely responsible for Poland’s transformation is Leszek Balcerowicz, the former finance minister who was later governor of Poland’s Central Bank. …The Balcerowicz Plan was built around permitting state firms to go bankrupt, banning deficit financing, and maintaining a sound currency. It ended artificially low interest rate loans for state firms, opened up international trade and instituted currency convertibility. …A miracle transition was under way and the rest is history. Since I’ve also compared Ukraine and Poland, you can understand why I especially liked this column. One final point. Today’s post looks at just a couple of nations, but I’m not cherry picking. There are all sorts of comparisons that can be made, and the inevitable conclusion is that markets are better than statism. Here are some previous iterations of this exercise. I’ve compared South Korea and North Korea. The data for Chile, Argentina, and Venezuela is very powerful. I’ve shown how Singapore has eclipsed Jamaica. Here’s a comparison of Sweden and Greece. And we can see that Hong Kong has caught up with the United States. So hopefully you can understand why I have a tiny (very tiny) degree of sympathy for my left-wing friends. It can’t be easy to hold views that are so inconsistent with global evidence. P.S. When presented with this kind of evidence, leftists oftentimes will counter by saying that many nations in Europe are rich by global standards, while also having large governments. True, but it’s very important to understand that they became rich nations when they had small governments. Moreover, some of them have wisely compensated for large public sectors by maintaining ultra-free market policy in other areas. Using a comparison of Jamaica and Singapore, I recently argued that growth should trump inequality. Simply stated, a growing economic pie is much better for poor people that incentive-sapping redistribution programs that trap people in dependency. In other words, nations with smaller government and less intervention produce better results than nations with bloated governments and lots of meddling. You see that relationship by comparing Jamaica and Singapore, and you also see it when examining other nations. This is fresh in my mind since I just spoke at the Kyiv stop on the Free Market Road Show. I told the audience about the reforms that Ukraine needs to strengthen economic performance, but I probably should have simply read what one expert recently wrote about Ukraine and Poland. Here’s some of what Allister Heath had to say for London’s City A.M. In the dreadful communist days, Ukraine and Poland used to be equally poor. The former was part of the Soviet Union, and Poland was one of the USSR’s satellite nations, belonging to the Warsaw pact. In 1990, both countries had roughly the same GDP per capita – their economies were eerily similar. A quarter of a century later, everything has changed… It’s a tale of two economic models, and a central reason why Russia – a waning world power desperate to cling on to its historic zone of influence – has felt able to bully Ukraine in such a shocking way. …The big difference is that Poland has pursued free-market policies, reducing the size of its state, introducing a strict rule of law and respect for property rights, privatising in a sensible way, avoiding the kleptocracy and corruption that has plagued regimes in Kiev, and embracing as much as possible Western capitalism. I prefer the Angus Maddison data, which doesn’t show quite the same divergence. But if you look at the chart, you still see an amazing change in relative living standards in the two nations. These numbers are shocking. Even with the Maddison data, Poland quickly passed Ukraine after the collapse of communism and now enjoys more than twice the level of per-capita output (and would probably have about three times as much per-capita GDP if the numbers were updated through 2014). This doesn’t mean, by the way, that Poland is a pro-market paradise. As Allister explains, it’s not exactly Hong Kong or Singapore. Poland’s tax system remains far too oppressive, the red tape is too strict and the bureaucracy still too redolent of the bad old days, the labour market is excessively regulated, parts of the population rejects elements of the new order and the country remains relatively poor, which explains why so many of its most ambitious folk have moved to the UK and elsewhere. But Poland has been one of the great success stories of the post-communist era, whereas Ukraine, tragically, has been one of the great failures. To add some details, Freedom of the World ranks Poland as the 59th-freest economy in the world. That’s not great, but it’s a lot better than Ukraine, which ranks only 126 out of 152 nations (behind even Russia!). More important, Poland’s overall score was only 3.90 in 1990 and now it is up to 7.20. Ukraine, by contrast, has only climbed to 6.16. 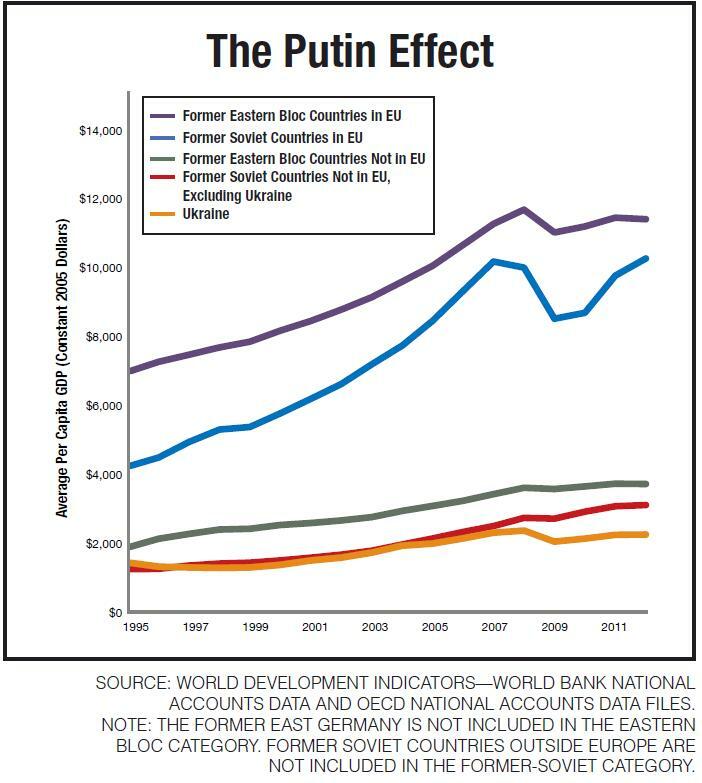 As I’ve already stated, their big problem is Putinomics. If they want to catch the West, they need free markets and small government. P.S. If you examine the five major factors in Freedom of the World, Ukraine does best in the fiscal policy measure (in part because it has a flat tax! ), but it has a horrible grade for monetary policy and doesn’t do well in the other areas. P.P.S. On the issue of ethnic division in the country, Ukraine also would benefit from Swiss-style decentralization. P.P.P.S. This chart comparing Argentina, Chile, and Venezuela also should be very persuasive to every open-minded person. P.P.P.P.S. I visited the Maidan Square, which is where the recent revolution took place. Here’s one of the main buildings that caught fire. 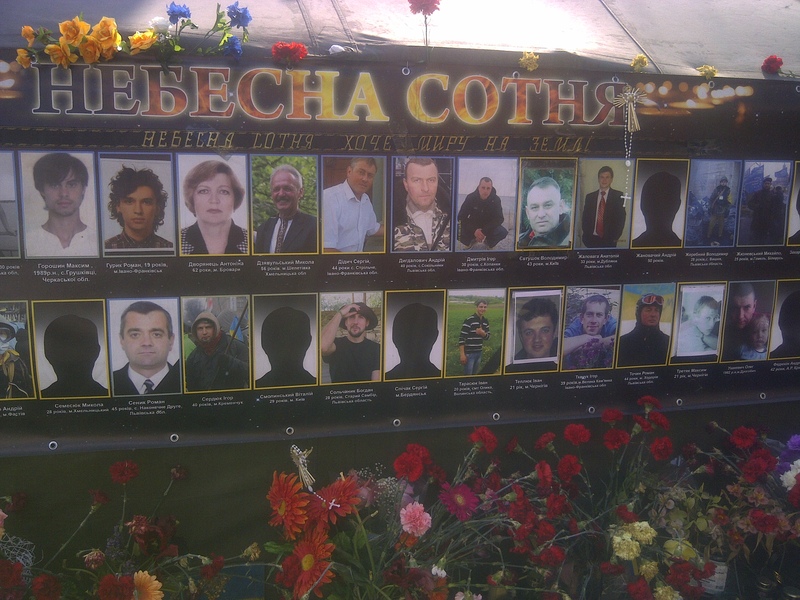 Here are pictures of those killed by (presumably) government snipers. And here’s yours truly playing tourist. 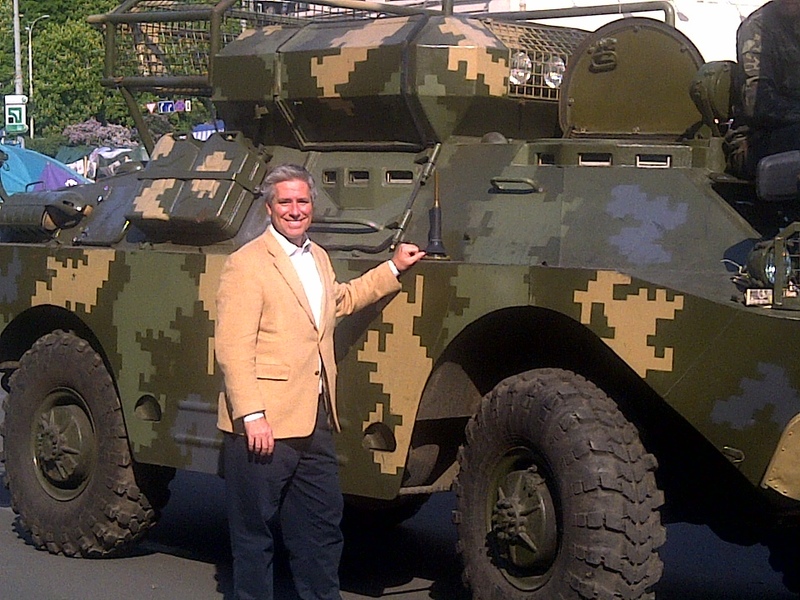 It’s only an armored personnel carrier, but it got me thinking that maybe I should copy other Americans and get my own tank? Poland’s government on Wednesday took an axe to part of the country’s pension system in a bid to bolster public finances. Premier Donald Tusk said that part of the country’s obligatory pension system run by private funds would be dramatically revamped, with 120bn zlotys ($37bn) in government bonds held by the 14 funds being transferred to the government pension scheme and cancelled… The funds will keep control of the 111bn zlotys they hold in equities and current benchmarks will be loosened. The funds will be banned from investing in more government debt. Tusk said that the millions of Poles currently enrolled in the privatised system would have the choice of staying in the scheme or of transferring their assets into the government-run pension system. Market reaction to the long anticipated move was negative. The Warsaw Stock Exchange, where the private funds, known as OFEs, have a big presence, was down by more than 2 per cent. Yields on 10-year Polish government bonds jumped to 4.75 per cent, the highest in a year. Is anyone surprised by the “negative” reaction?!? Of course markets are unhappy when politicians arbitrarily seize wealth for short-term political games! Sounds like Poland wants to become the Argentina of Europe. Though there’s always plenty of competition in the contest for bad government policy. But we do have a bit of good news. Here is some interesting polling data from an article on the political preferences of young Americans. …51 percent of Millennials believe that when government runs something it is usually wasteful and inefficient, up from 31 percent in 2003 and 42 percent in 2009: “Hardly a ringing endorsement for a bigger government providing more services.” There’s more: 86 percent of Millennials support private Social Security accounts and 74 percent would change Medicare so people can buy private insurance. Sixty-three percent believe free trade is a good thing. Only 38 percent of Millennials support affirmative action. Wow, 86 percent of young people support personal retirement accounts. That’s very encouraging, particularly since the general population supports this pro-growth reform by a more-than 2-1 margin. Here’s a video that explains why a privatized or “personalized” Social Security system is the only way of dealing with the current system’s bankruptcy without screwing younger workers. I think the video is a good summary explanation, but I also invite you to look at these two charts, one showing the impressive private wealth being accumulated in Australia thanks to personal retirement accounts and the other showing the staggering future shortfalls for America’s pay-as-you-go Social Security scheme. If those charts don’t convince you, I suspect you’re a genetic statist. P.S. The thievery of the Polish government is a helpful reminder of why it’s good to have some of your money offshore, preferably managed by a non-US company. After all, does anyone doubt that American politicians are capable of the same venal behavior? They’re probably looking at the money in IRAs and 401(k)s and salivating at the thought of how many votes they could buy with all that money. If (or when) that tragic day arrives, the Americans who have their money beyond the grasp of the federal government will be very happy. P.P.S. Here’s a good joke about the Social Security system. Except it’s not really a joke because it’s too close to the truth. P.P.P.S. You can see President Obama’s proposed “solution” to the Social Security crisis by clicking here. I don’t think you’ll be surprised to learn that it means a big shift of money from taxpayers to politicians.